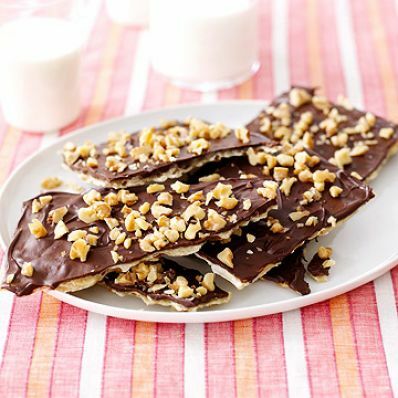 This traditional Passover treat layers matzoh boards with a butter and sugar mixture sprinkled with chocolate chips and walnuts. 1 of 5 Heat oven to 350 degrees F. Cover a 15-1/2 x 10- inch jelly roll pan with nonstick foil. 2 of 5 Line the prepared jelly roll pan with the matzoh to form a single layer, breaking pieces as necessary to fit. Sprinkle with salt. 3 of 5 In a small saucepan, bring the butter or margarine and sugar to a boil. Pour mixture evenly over matzoh. Bake at 350 degrees F for 10 to 15 minutes or until matzoh is lightly browned. 4 of 5 Remove pan from oven and sprinkle with the chocolate chips. Working quickly, spread melting chips over matzoh. Sprinkle with the chopped nuts. 5 of 5 Freeze for 3 hours. Break up into 2-inch pieces to serve.